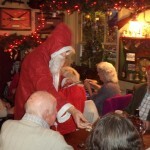 The Annual Christmas / New Year lunch party for the Village over 60’s will be held in the Red Lion, Bletchingley, from 2pm on Wednesday 2nd January 2019. This is an opportunity for our senior citizens to gather for an afternoon over a drink, a nice meal and some entertainment and to meet each other and some of our local volunteers, in a festive setting. The day normally consists of a welcoming drink, a two course meal, background music with sing-a-long, some form of quiz and a visit from Santa. It is the Bletchingley Village Fair Committee’s chance to say thank you to the village for supporting us, and a chance for others to put a face to a name. Although the day is paid for by the BVFC, and attendance is by invitation only, it is far from a charity hand-out and the organizers are keen to stress that they hope everyone will come along for a unique social event, just for the fun of meeting people and exchanging views.